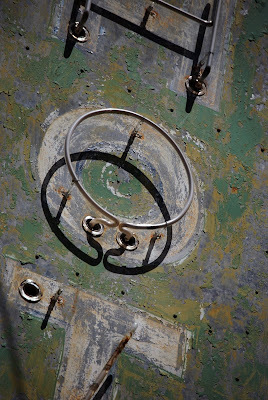 From adventurous eyes of a mortal whose steps their stage had led. One of my favorite shows on PBS is History Detectives where individuals track down the story behind significant objects from the past, often times finding out much more than was known before and making fascinating connections between yesterday and today. I was given the opportunity to play history detective when my minister presented me with the name H.F. Bailey and asked me to see what I could find out about him. Bailey, my minister's grandfather, also served as minister in Orlando at an unknown church in the 1920s. The story I was told is that he discovered the love of his life in a restaurant and left his family to be with her. And this restaurant served squab. My small collection of local history books lead nowhere, so I turned to another resource, a local minister with a degree in architecture who did ground-breaking research on the Orlando architectural team of Ryan and Roberts, who practiced in Central Florida in the 1920s. He found this piece of evidence, undertakers notes from Carey Hand, propreiter of the one of Orlando's oldest funeral homes. 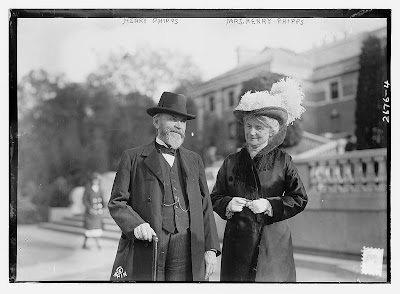 It shows that a Reverend Harvey P. Bailey died on January 9, 1921 at the age of 73. The $125 cost of the casket was charged to the deceased son, H. F. Bailey, who also preached the funeral. We had found him! A vital piece of information is that it says he lived in Fairvilla. 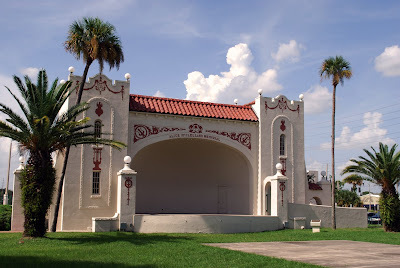 Fairvilla is a community just to the west of College Park, a suburb of Orlando developed in the 1920s. Although I'm not sure of it's actual boundaries, it's roughly the area north of SR 50 along US 441. We knew he was a Methodist minister and the next lead came from A Guide to Supplementary Vital Statistics from Church Records in Florida, Volume III: Orange - Washington Counties, 1942. It lists the only church in Fairvilla as being the Fairview Methodist Episcopal Church, South, founded in 1898 and disbanded in 1933. My friend found even more important information in A Guide to Historic Orlando by Steve Rajtar. According to Rajtar, the building used by the "Fairview" or Fairvilla Church was moved to Concord Street in the Parramore Community and was incorporated into another church's property. The building is now called Henderson Hall after J.D. Henderson, one of the the Fairvilla church's founders. The next expert to help with our history sleuthing was the former historic preservationist for the city who confirmed that on the back of the church property was a building that fits the bill for the structure that may have been originally the Methodist Church in Fairvilla. Having heard this, I had to see it for myself. 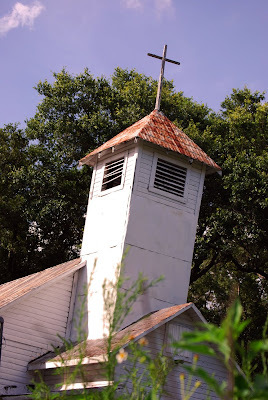 The church on the corner of Parramore and Concord is currently Emmanuel Methodist Church. 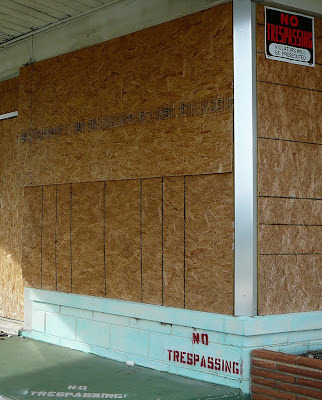 The building in question is a gray wood frame structure situated behind the brick buildings that were erected in the 1940s. It's very modest, but at the time it was constructed it was probably perfect for what was needed. 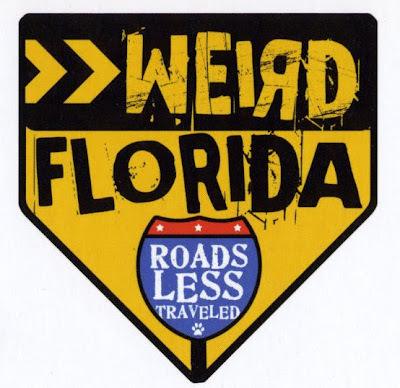 This week I went to a screening of Weird Florida: Roads Less Traveled a film put together by Charlie Carlson, one of the authors of the Weird Florida book. 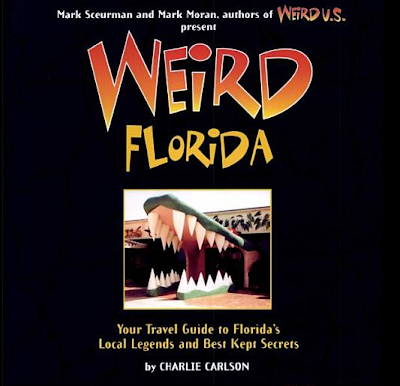 Charlie is "a tenth generation Floridian, folk historian, author and explorer of the Sunshine State's unexplained phenomena." 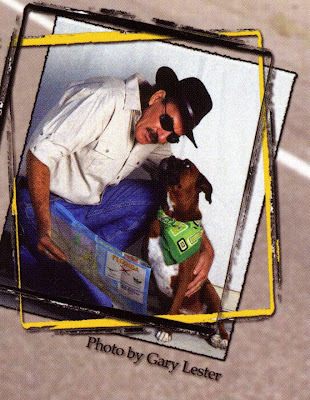 He travels the road with his dog, Miss Scarlet, visiting some of the states funkier attractions and lesser known spots. Charlie has a cornball sense of humor and a "Hank Hill" delivery, but he reveals some of my very favorite places. He starts at the very tip of the state, at the Southernmost point monument in Key West and works his way north, stopping at different places along the way. 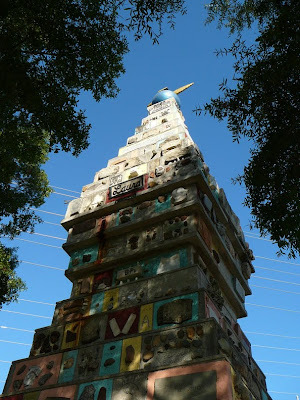 He hits some sites that are at the top of my list to visit in the near future, like the Coral Castle near Homestead, Soloman's Castle near Ona, and the Koreshan Utopian Settlement near Estero. 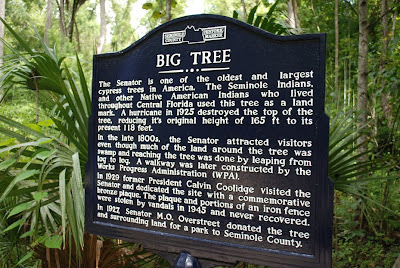 He also hits some of my old favorites like The Senator in Longwood, the Monument of States in Kissimmee, and some of my favorite interesting towns like Christmas, Cassadega and St. Augustine. 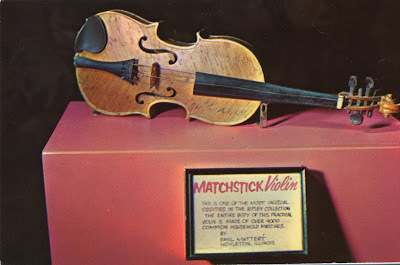 One of the most interesting segments was visiting the Ripley's art department in Orlando to show how they make reproductions of some of their oddities. 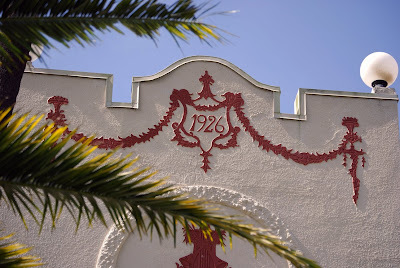 One of the places I really want to visit is the original Ripley's Believe It or Not in St. Augustine which is housed in the old hotel originally owned by Marjorie Kinnan Rawlings and her husband, in which they were visited by another legendary Florida write, Zora Neale Hurston. The film will be on PBS in Florida starting in September. While the humor may make you wince, the film reveals some great out-of-the-way spots and could be a useful guide when putting together your next Florida roadtrip. 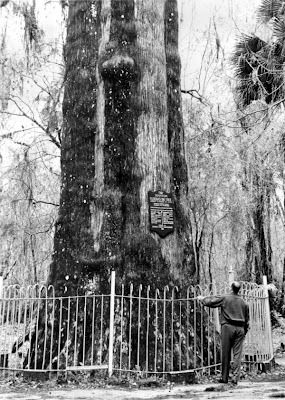 Last Thanksgiving we stayed at a HoJo's in St. Augustine with a huge Live Oak in the courtyard nicknamed the Senator. 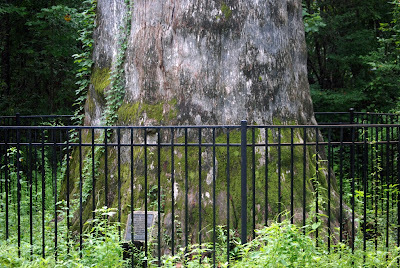 The sight-seeing Trolley Tours would drive through the parking lot on the way to the Fountain of Youth and always tell the same joke about the 400 year old tree: "Know why it's called the Senator? Because it's shady and it's crooked." 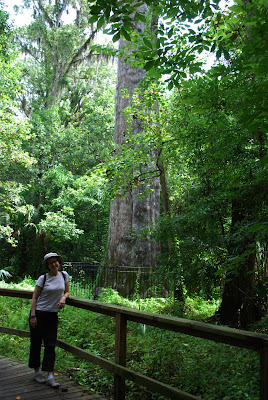 • The tree originally was 165 feet high but a hurricane in 1925 knocked the top off and it is now only 118 feet tall. 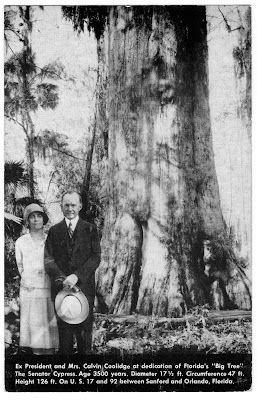 • A landmark to Florida's native Americans, the tree drew visitors in the late 1800s despite being in the middle of a swamp. • The WPA built a walkway to The Senator during the New Deal. 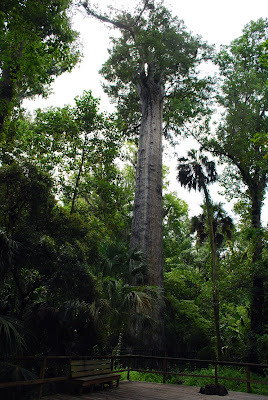 • The tree is estimated to be around 3,500 years old meaning it sprouted in the age of the pharohs in ancient Egypt. 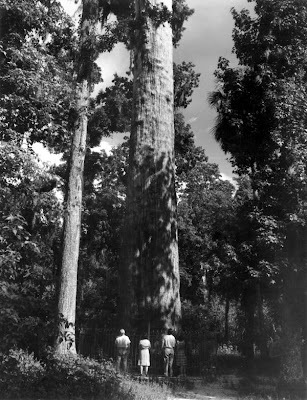 • There were originally 4 large cypress trees together but only 2 have survived. 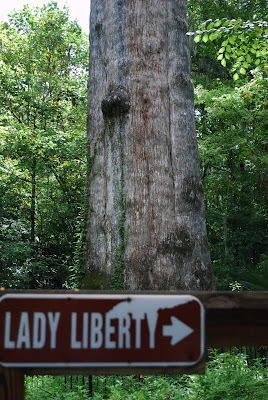 The Senator's companion tree, known as Lady Liberty, is a mere 2,000 years old. 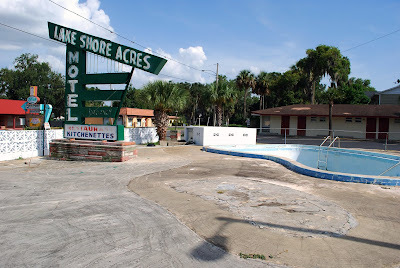 I've been yearning to visit Florida's oldest attraction for some time and sadly was there when lighting conditions were at their worst for photography. 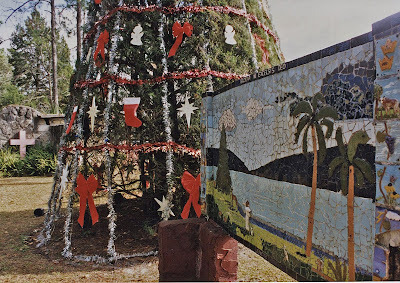 But in reality the tree is so large there is no good way to show its size in a 2-dimensional photograph. 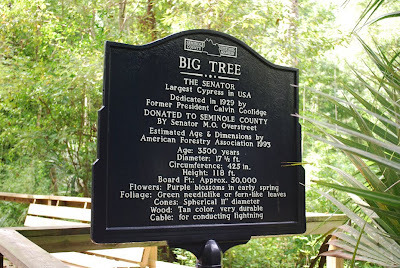 Just a short drive from Orlando, there is no admission charge to see the big tree and it is well worth the trip. There is a paved trail just outside the park and a bridge over US 17-92 for pedestrians and cyclists. On my return visit I'm bringing my bike! I found this postcard at Renningers Antique Market in Mt. Dora recently and was drawn to it because of its size (PICTURAMA Queen Size card) and the subject matter. 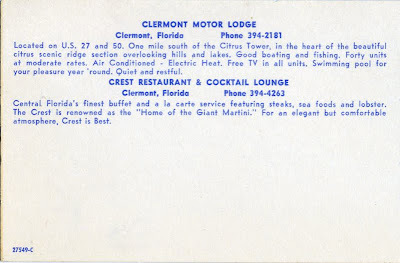 It shows a fish eye view from the middle of US 27 looking towards the Crest Restuarant & Cocktail Lounge and the Clermont Motor Lodge in Clermont Florida. The location is a place I keep returning to again and again to document what happens to Pre-Disney old Florida in the 21st century. The postcard, probably from the 1960s, has red arrows pointing out items of interest like the Florida Citrus Tower, the junction of SR 50 and US 27 and the aforementioned properties. 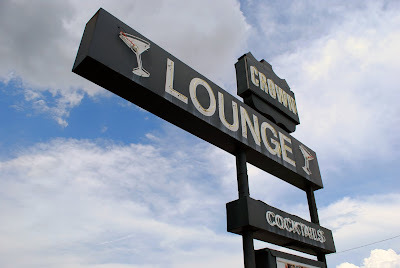 The Crest Restaurant, a gorgeous mid-century building with rooftop and roadside neon signs, looks brand new. Next door, the Clermont Motor Lodge looks very picturesque and quiet. This part of Central Florida was once in the center of the citrus industry and US 27 was one of the major arteries bring folks to Florida from the north. Located on U.S. 27 and 50. One mile south of the Citrus Tower, in the heart of the beautiful citrus scenic ridge section overlooking hills and lakes. Good boating and fishing. Forty units at moderate rates. Air conditioned- Electric Heat. Free TV in all units. Swimming pool for pleasure year' round. Quiet and restful. Central Florida's finest buffet and a la carte service featuring steaks, sea foods and lobster. 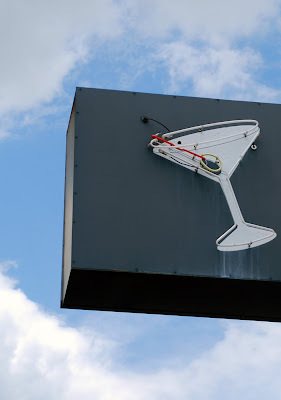 The Crest is renowned as the "Home of the Giant Martini." For an elegant but comfortable atmosphere, Crest is Best. 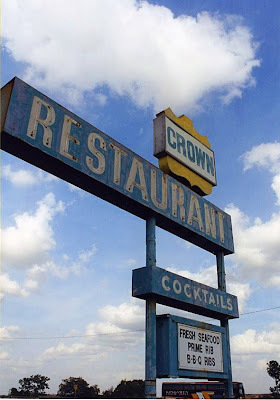 When I happened upon the location, some years ago in my pre-digital era, the Crest had become Crown Restaurant. 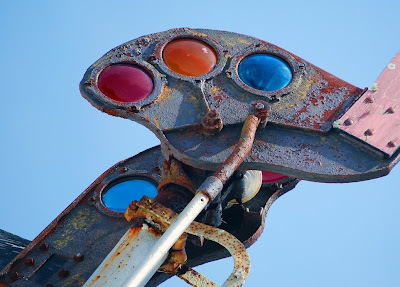 The sign, originally red and black had been painted blue and yellow. 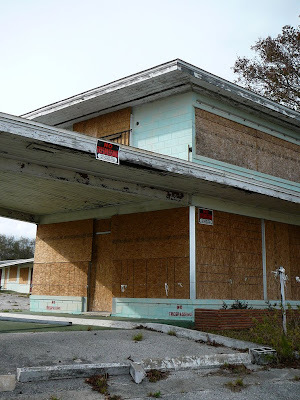 The Clermont Motor Lodge was in operation, barely. 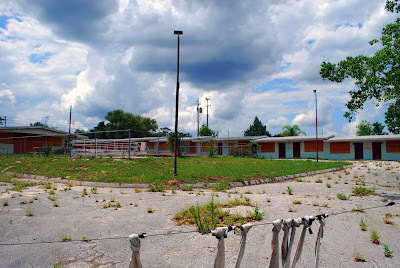 Sadly the Clermont Motor Lodge property is empty and for sale. 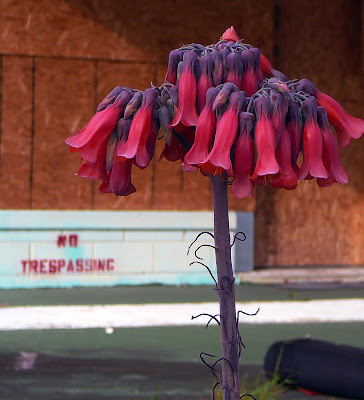 No trespassing signs are stenciled everywhere and all the windows are boarded up. Once sporting two monumental roadsigns, the only signage viewable from the road today are the "For Sale" signs. It is my guess that the only thing that has kept this property from being demoed is the current economic climate. 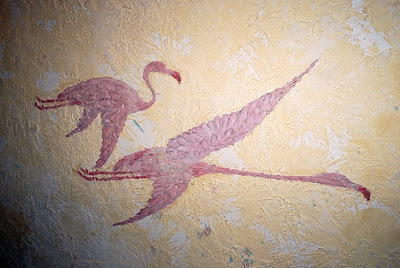 Artist Joy Postle and her husband Robert Blackstone came to Florida at a time when poaching birds for their plumes was still a viable way to earn a living. 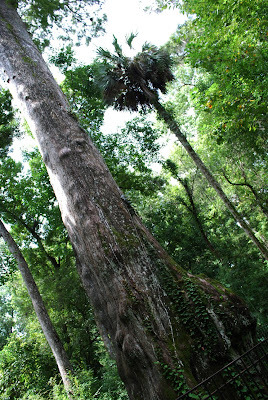 Camping in the Everglades, they came encountered a lawman who warned them to be aware of dangerous poachers. He gave Joy a small Derringer pistol as protection and today the little gun is in the archives of the University of Central Florida. Ever the adventurers, Postle and Blackstone eventually did cross paths with poachers, but used the opportunity to purchase some bootleg liquor, so the story goes. 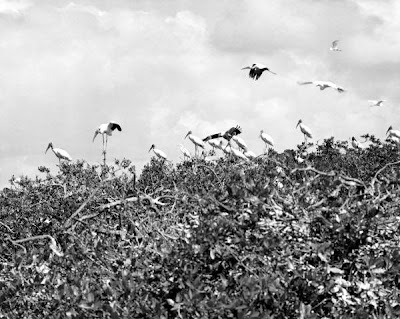 Postle describes living amid a bird rookery: "We were so entranced by the egrets, herons, ibis, and other wading birds, that we wanted to know them intimately. We learned that they nested in large colonies or "bird cities," usually on islands or in dense swamps...We made daily visits to the bird colony, and from a perch in a leaning live oak, watched the courting, nest building, brooding of the blue-green eggs, and feeding of the young...The plume birds accepted us as good neighbors, and some returned our visits...."
Some of the first "bird cities" to be protected from poachers in the United States were created right here in Florida. "Pelican Island holds a unique place in American history, because on March 14, 1903, President Theodore Roosevelt designated it as the Nation's first National Wildlife Refuge to protect brown pelicans and other native birds nesting on the island. 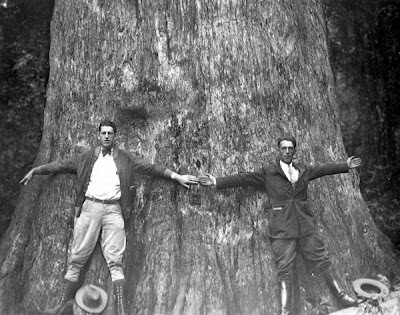 This was the first time the federal government set aside land for the sake of wildlife. The Refuge celebrates its Centennial Anniversary in 2003 and now the refuge system consists of more than 530 refuges on nearly 95 million acres of our nation's most important wildlife habitats." 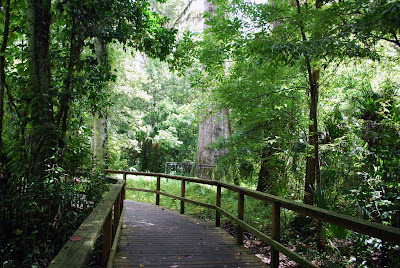 According to this website, "the reserve was purchased In 1910-11, when Florida Audubon Society member Oscar Baynard encouraged the National Audubon Society to purchase the property in Alachua County." The site also states that conservationist and bird expert T. Gilbert Pearson wrote about the colony in Birds of America, originally published in 1936. Audubon of Florida today still owns 113 acres of lake bottom and most of Bird Island east of the town of Orange Lake between Gainesville and Ocala. 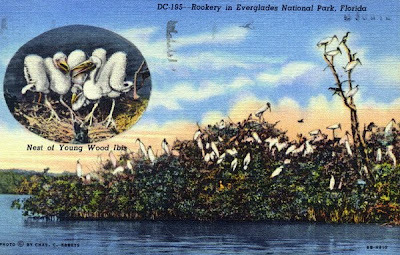 "An important rookery for herons, egrets, and White Ibises, it was established in 1910 as the first Audubon sanctuary in the United States" and it was the only rookery that was successfully defended against the plume hunters, according to the Audubon website. From the NWR website: "This unique refuge was established in 1931 to provide wintering habitat for migratory birds. It is one of the oldest refuges in the National Wildlife Refuge System. It encompasses 68,000 acres spread out between Wakulla, Jefferson, and Taylor counties along the Gulf Coast of northwest Florida. The refuge includes coastal marshes, islands, tidal creeks and estuaries of seven north Florida rivers, and is home to a diverse community of plant and animal life. The refuge also has strong ties to a rich cultural past, and is home to the St. Marks Lighthouse, which was built in 1832 and is still in use today." 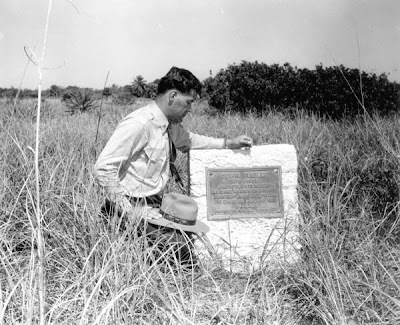 Today the legacy of those pioneering environmentalists endures in Florida, as birds have become a large part of state's iconography. 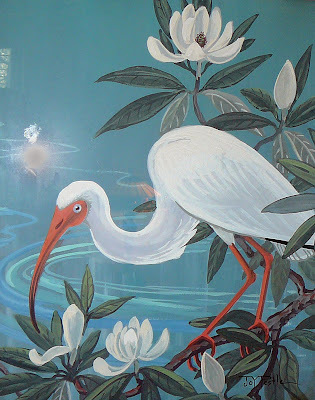 Contemporary artists follow in the footsteps of John James Audubon, Joy Postle, Sam Stoltz and even the Highwaymen in keeping the creative tradition alive of using Florida's birds as subject matter. We have the individuals who created those preserves at the beginning of the 2oth century to thank for sticking their necks out for our fine feathered friends or there might not be any wading birds left for us to celebrate. 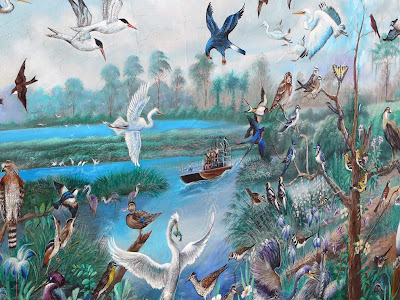 This image from the Florida state archives tells this story: "In the late 1800s many species of Florida's wading birds were nearly driven to extinction by plume hunters. The plume trade, which supplied feathers for popular ladies' hats, was highly profitable. In 1903 the value of an ounce of egret nuptial plumes, called aigrettes, was estimated to be worth twice the amount of an ounce of gold. 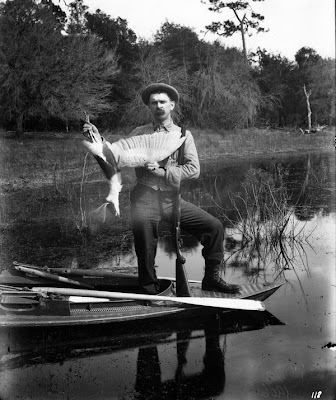 Despite laws against plume hunting passed in Florida in 1891 and again in 1901 hunting did not stop. 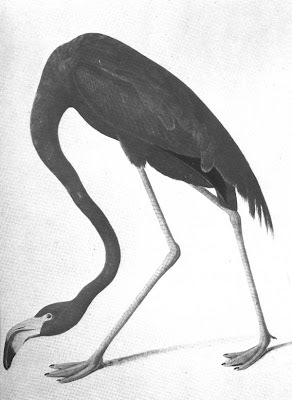 Wading bird populations in Florida suffered until the sale of wild bird plumage was made illegal by the New York legislature in 1910. Today (2009) all species of wading birds are protected by state and federal law. 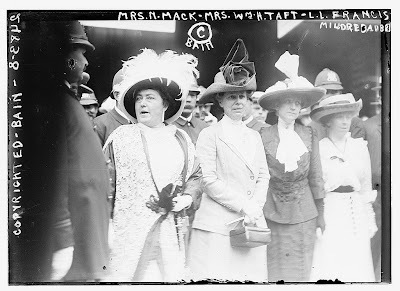 "-Florida State Archives. 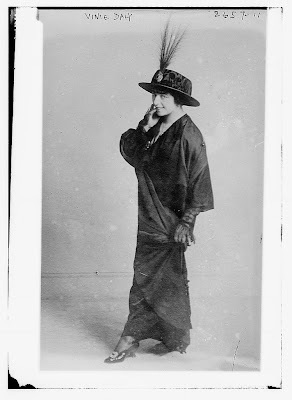 An interesting fact is that the fight to stop plumage in ladies hats was on reason for the formation of the Audubon Society. 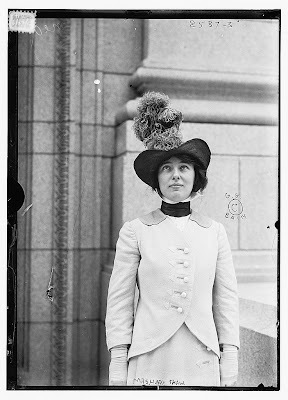 According to the post on answers.com about the Audubon Society's history, the organization began when the editor of Field and Stream magazine became leader in a movement to outlaw the slaughter of birds for the purpose of decorating women's hats. "Membership was open to everyone refusing to wear bird feathers as ornaments and/or willing to prevent the killing of wild birds not used for food and the destruction of their eggs," and in the first issue of Audubon Magazine it was reported that the hunting of birds "now takes place on such a large scale as to seriously threaten the existence of a number of our most useful species." 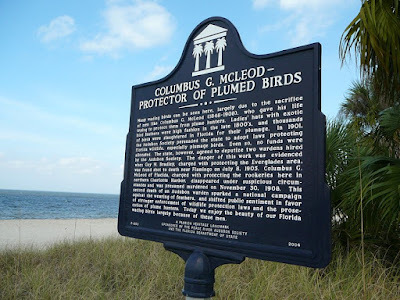 A monument in Punta Gorda takes up the story stating that "in 1901 the Audubon Society persuaded the state to adopt laws protecting Florida wildlife, especially plumage birds." 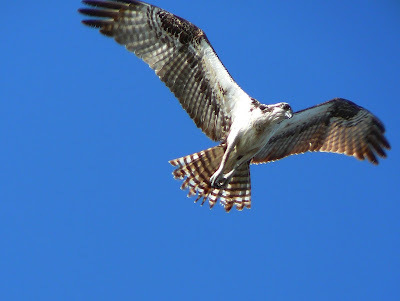 The state however provided no manpower to enforce the laws so two wardens hired by the Audubon Society were deputized to protect Florida's birds. 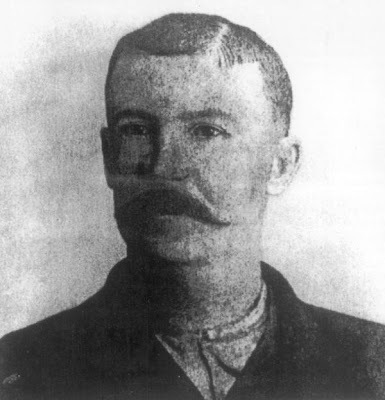 The warden assigned to the Everglades, Guy M. Bradley, was found shot to death by poachers in 1905. The other warden, Columbus G. McLeod, disappeared from the Port Charlotte area in southwest Florida and was presumed murdered in 1908. The marker continues "This second death of an Audubon warden sparked a a national campaign against the wearing of feathers, and shifted public sentiment in favor of strong enforcement of wildlife laws and the prosecution of plume hunters." "This house was personally built in 1893 by John Phillip Donnelly for himself and the former Annie Stone, whom he married on August 27, 1891. 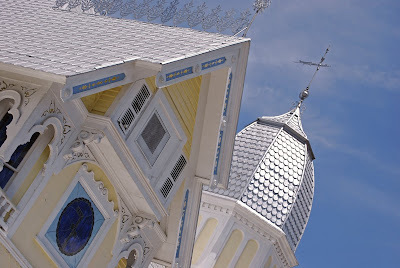 It shows a Queen Anne Style, with an octagonal turret and wraparound porch. 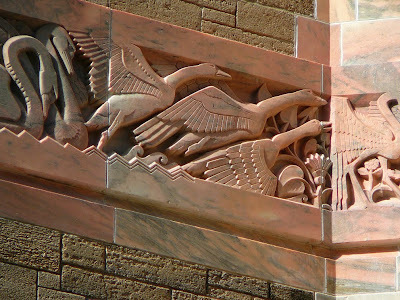 In 1930, it became the Masonic Temple Lodge. J.P. Donnelly, originally from Pittsburgh, Pennsylvania, laid out the town and served as its first mayor. 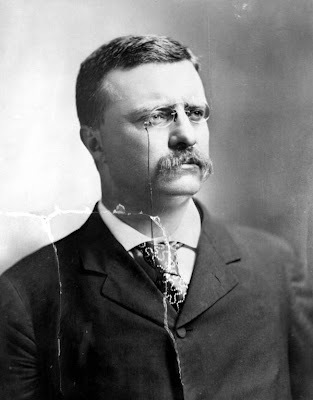 He had homesteaded 160 acres in 1879, and by marrying the former wife of William D. Stone, he doubled his holdings. A building on the campus of the Montverde Academy is named after him, as thanks for his generous contributions. 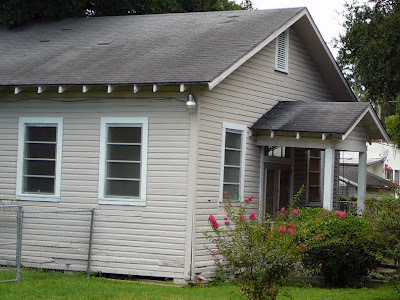 This home was placed on the National Register of Historic Places in 1975." The house may very well be the work of George F. Barber, a prolific Victorian architect who created illustrated catalogs of house designs. The hilly downtown area includes a 1915 Train Depot, now used by the Chamber of Commerce, and the beautiful Lakeside Inn, among other architectural gems. 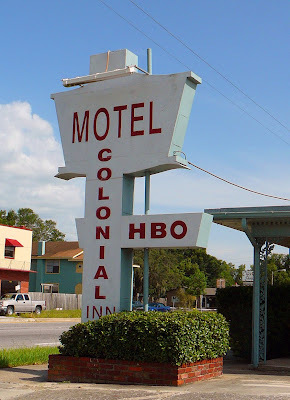 Down US 19 in Eustis I found a couple of interesting mid-century roadside relics. 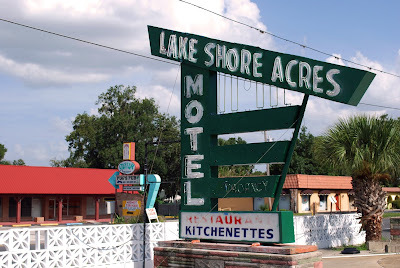 First was the Lake Shore Acres Motel. 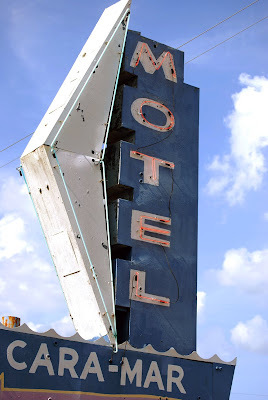 I found images of the once cool sign on Flickr, it appears to me the sign has been repainted (with spray paint) since then. It's kind of sad, but it's a good example of what can happen when roadside resources aren't cared for, when times are rough financially. 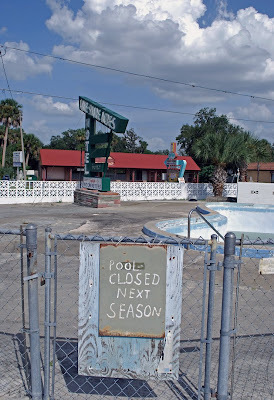 The pool had obviously been closed for quite some time and doesn't look to re-open any time soon. 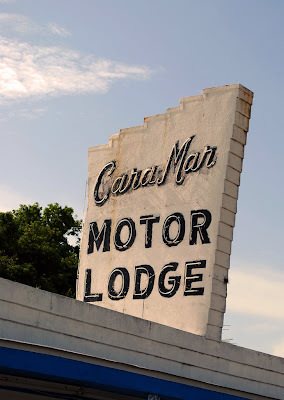 Just down the street was the Colonial Inn Motel, (world's worst tripadvisor.com review), and the Cara Mar Motel. The owner of the Cara Mar came out while I was shooting and was very proud of having restored the neon on both his signs. He appeared to have fixed up the swimming pool as well and I appreciate the effort in trying to keep the place viable.